Starting from an idea of former champion surfer and local PE teacher Brenda Miley to help her friends learn to surf; Lets Go Surfing has brought happiness to hundreds of thousands of people. Brenda learnt to surf on her dads back at age 3; she then went on to start surf lessons in 1995 out of the back of an old VW kombi van in the carpark of Bondi. Lets Go Surfing is now recognised as a pioneer and market leader in delivering safe surfing experiences and surf education in Australia. 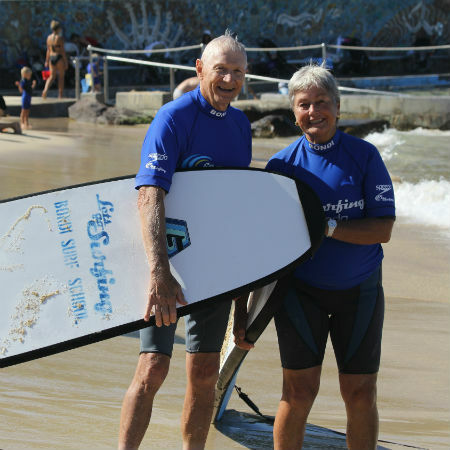 During Seniors week each year LGS provides exclusive Senior Surfing Programmes at Bondi, Maroubra and Byron Bay beaches…we call them the “Silver Surfers” delivering learn to surf and surf education courses to seniors in our community for free. These programmes coincide with Seniors Week activities and are available for anyone active over the age of 55 and all are welcome… locals, interstate and international visitors! The sessions suit beginners, scaredy cats or those wanting to get back into surfing. The lessons are safe, fun and tailored to suit seniors. Surf school Director Brenda Miley’s professional team has taught men, women and children to surf safely and how to enjoy the beach. Lets Go Surfing, Changing Lives…. One wave at a time.